Tagged with " spray paint"
Do you by chance remember my messiest closet ever? I don’t blame you if you don’t. I posted about that renovation back in May with a goal of being done in June. To be fair, I was 95% of the way done in June. I just had two tricky parts, one I eventually found a solution for and one that is still ongoing. 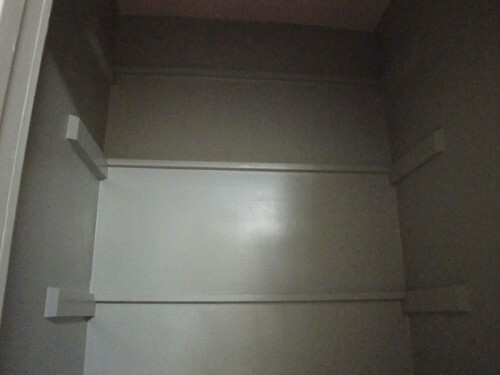 To recap, this is the closet before. I know, it is like a room on Hoarders. I started off by doing just as I planned. I painted the door to match the trim in my house. I had planned to buy a door organizer from Home Depot but when I arrived in my car I realized the organizer would probably not fit in my car. I could borrow my mom’s van but I’d remembered seeing a smaller organizer at Target. 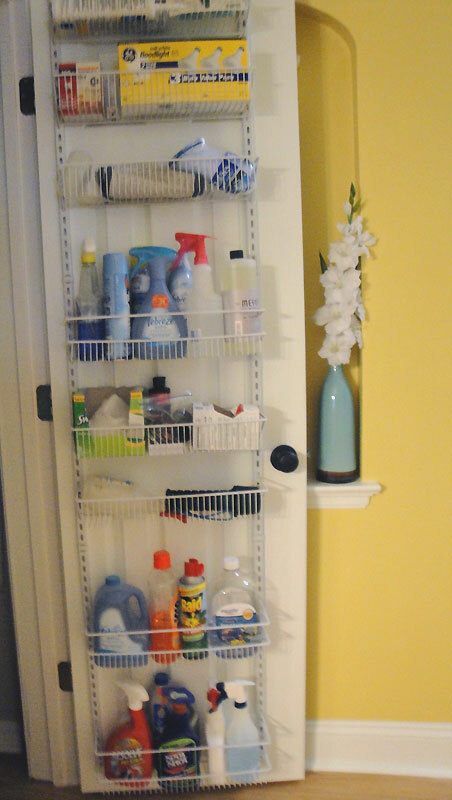 Enter the ClosetMaid 8-Tier Adjustable Door Rack. (You might also want its buddy, some hollow door anchors that I ended up having to run back to Home Depot for). 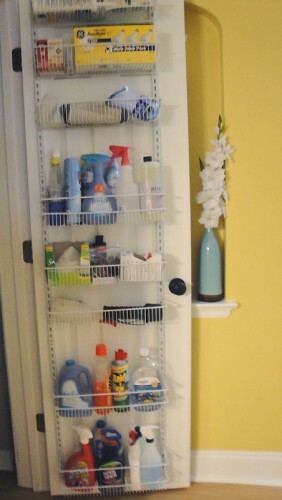 I then used that door organizer to put all my cleaning supplies in it. I’m still working on reducing how many containers I’m using but as I run out I’ll be replacing with more multi-purpose products. 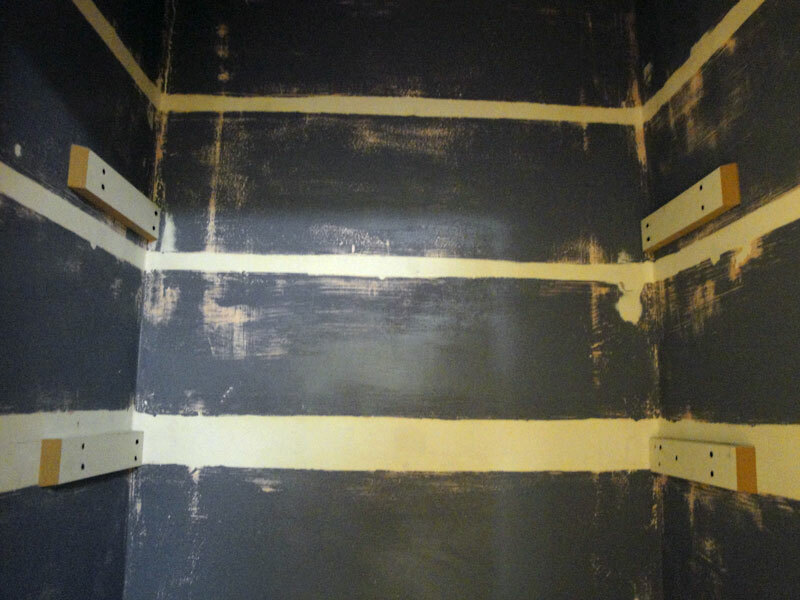 Next up was emptying the closet, patching, priming, and painting. I had no clue that my crooked house had a closet with walls that sloped in random directions. I ended up spending nearly a week just on patching and sanding to try to make the walls straight. In an effort to keep costs low, my husband and I thought we should reuse the original shelves and just hang them with two boards. In the photo above you can see the new boards attached to the wall while the white stripes represent how the shelves used to be hung. Wonder why they had a back shelf hanger? Those crooked walls. Apparently the walls were crooked even when they built the house so they just made small shelves and used an extra-wide shelf rack to accommodate their mistakes and laziness. So by being cheap/lazy, we ended up with the same issue. We had to create one more shelf hanger but luckily our entire basement is full of scrap wood so we still saved on cash. The new shelves were much less obtrusive than the old ones and we painted them the same paint color as the walls to help them blend in. The paint color is a mistint from Home Depot. My local Home Depot seems to only have orange and forest green no matter when I go but this was one in West County so let’s call this right place, right time. 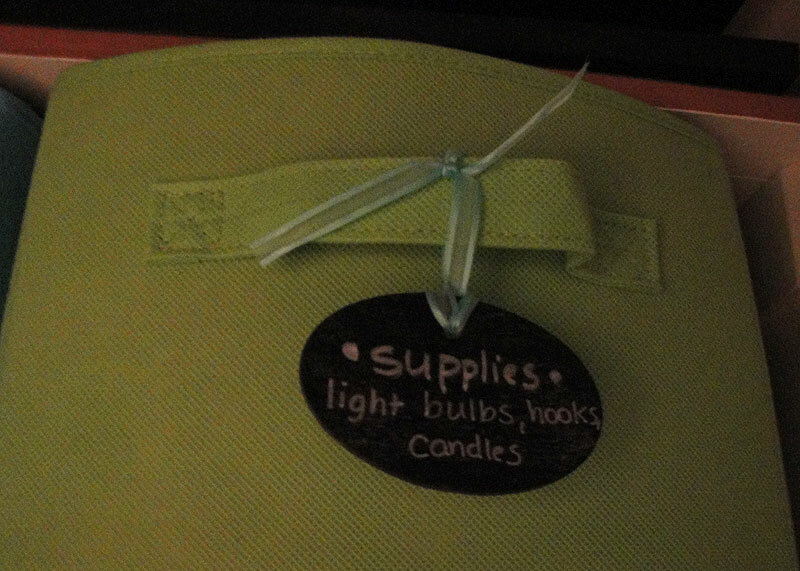 To make things even more organized I spent about $2 on small wooden tags from Michaels. I spray-painted them with chalkboard paint and used them to label those Closetmaid cubes. The basket above holds all my extra lightbulbs, 3m strips, and candles. I have another one for seasonal gear like gloves and bags, and the third basket holds my extra cleaning items like vacuum bags or my shoe shining kit. Everything is labeled so I don’t need the products out in the open. I also decided that I should probably get a full-sized ironing board instead of using my 9 year old dorm ironing board. I’ve already used it and it’s amazing the difference it brings. As a bonus, it really brightens up the closet and it matches my cubes I already had. Ready for the final effect? The top now easily fits all those items that used to sit on my closet floor. 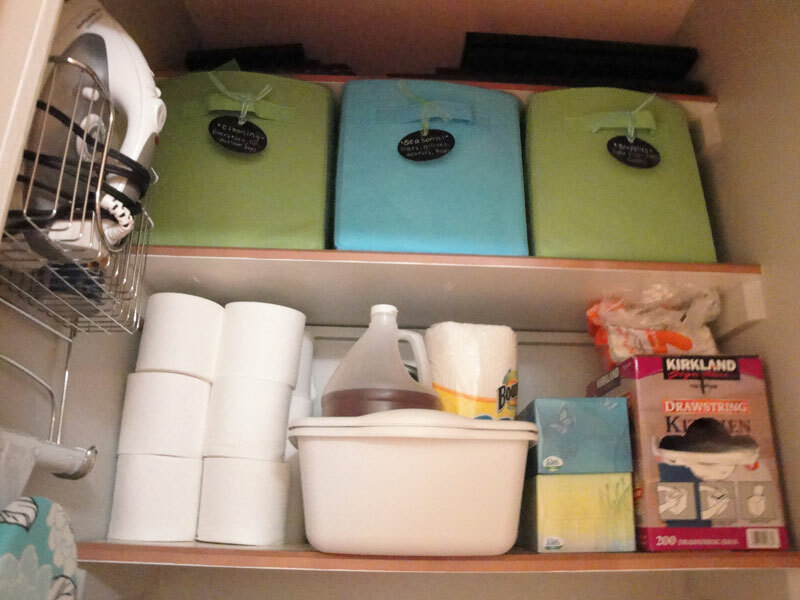 I have space for paper products, trash bags, vinegar for cleaning, all my bins, and even extra picture frames at the top. The bottom of my closet it worlds better. You can actually see the floor! 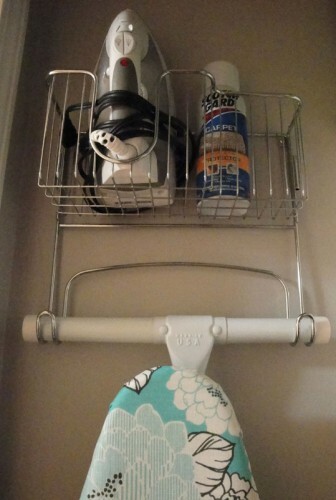 Over on the right I hung my swiffer and broom with a rack from The Container Store. I hung several cleaning items from my top Bygel rail and you can see my Rationell stuffed with the cloths. 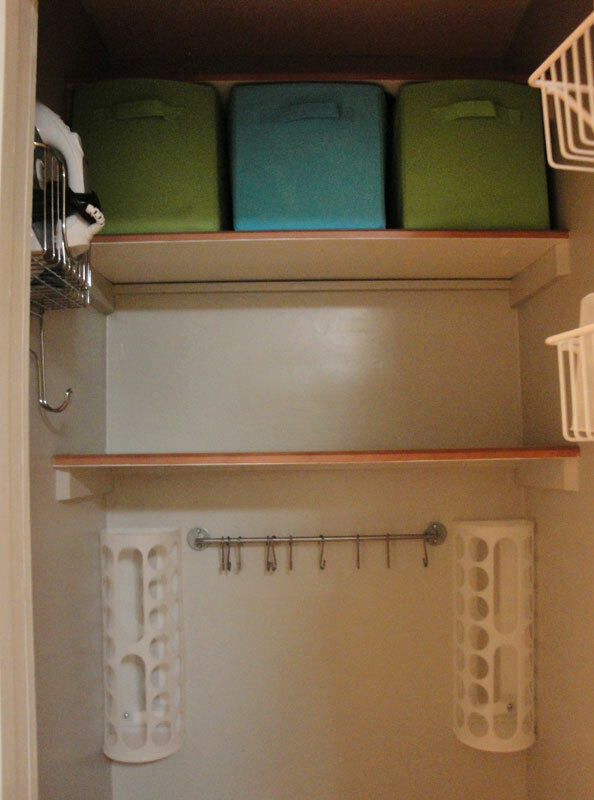 I decided to use the bottom rail to include the bags I use for shopping and day trips so the closet is even more practical. It might not be as pretty as without them but let’s be real, the practical has to win when you live in your house. 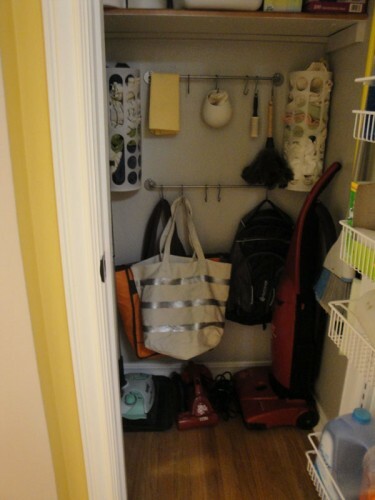 Somehow I managed to actually put more items into this closet and it miraculously looks emptier. I am still needing a light in there (hence the dark photos) but having a lighter paint color and a more open space helps immensely in the meantime. This project is being put in the finished category and I’m ready to tackle a new one. Home Depot sent me a coupon in the mail this month that I need to use soon so maybe that’ll jumpstart a big project once again. Hopefully this gets my closet out of the “Worst Closet Ever” category and into something a little more flattering. I had wanted to build a birdhouse for quite a while. 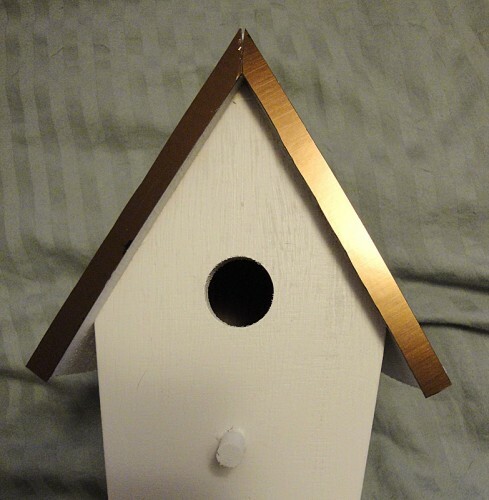 And by “build a birdhouse” I really meant decorate one so when Michaels had a sale on their plain wood birdhouses, I picked one up and got started on the decorating part. 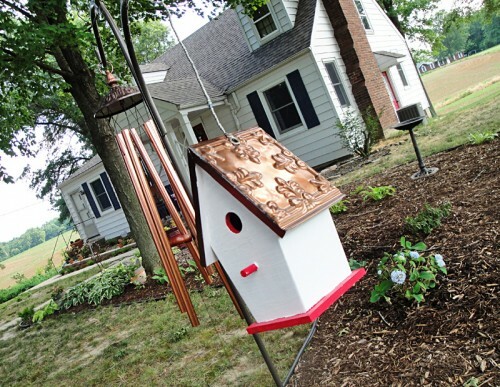 My goal was to make the birdhouse coordinate both with my house, which is red, white and blue, and my garden, which has a lot of copper pieces in it. 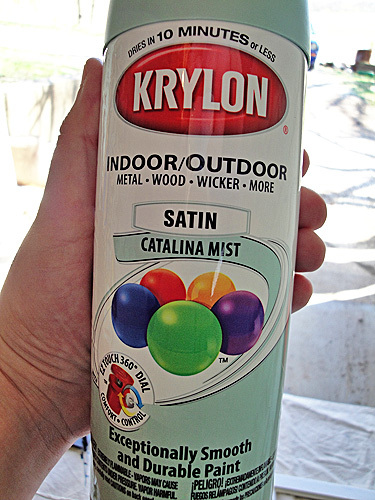 First up was spray painting the house white. I wanted just a light coat to let the wood grain shine through so I used a spray primer. Next was my plan to tie in those copper influences. I found some kitchen backplash tiles at Lowes. I bought a whole sheet and used only 2 panels so I have plenty leftover for another project up my sleeve. You see those extra inches on the left without any detailing on them? I used them to make a nice front for the birdhouse’s roof while I used the actual panels to cover the roof. 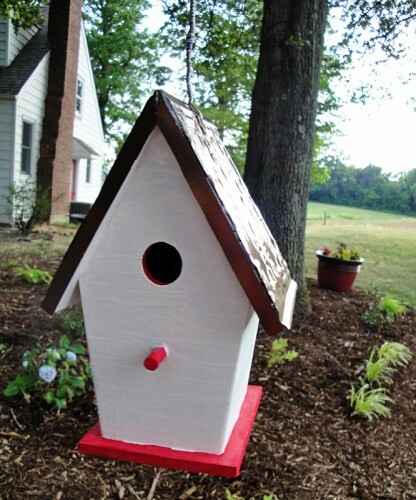 I just used some scissors to cut and hot glue to adhere it all to the birdhouse. I decided to paint some red accents on with some basic acrylic paint. I just painted the perch and the base. 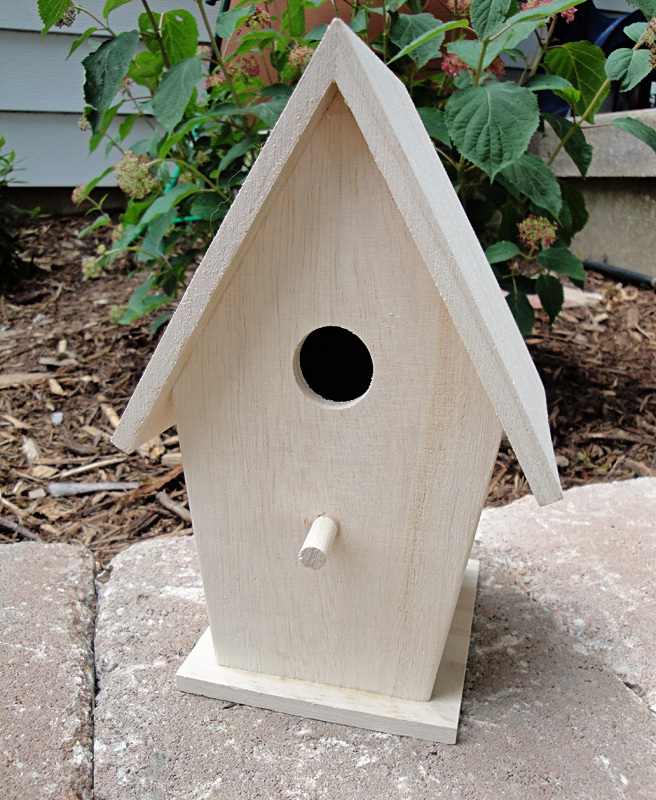 Now the next most important part was to drill a hole in the top of the birdhouse so I could hang it outdoors. I just drilled a hole directly across the top with a small bit. To help it stay more decorative, I added some grommets to cover the holes but I needed a larger bit to make sure it fit. I just hot glued them in place when I got the hole the right size. Now I wanted to protect all my hard work so I sprayed on a clear lacquer before putting it outside. I let it dry 24 hours because of the high humidity here. I didn’t want any haze in my topcoat. Here’s the final look. Don’t you just love how well it matches my new windchime? I also included a secret pop of red right at the entrance. While I don’t really expect many birds to make this their home, I do think I’ll drill some small holes in the bottom just in case so rain can drain out. How have your projects been going? 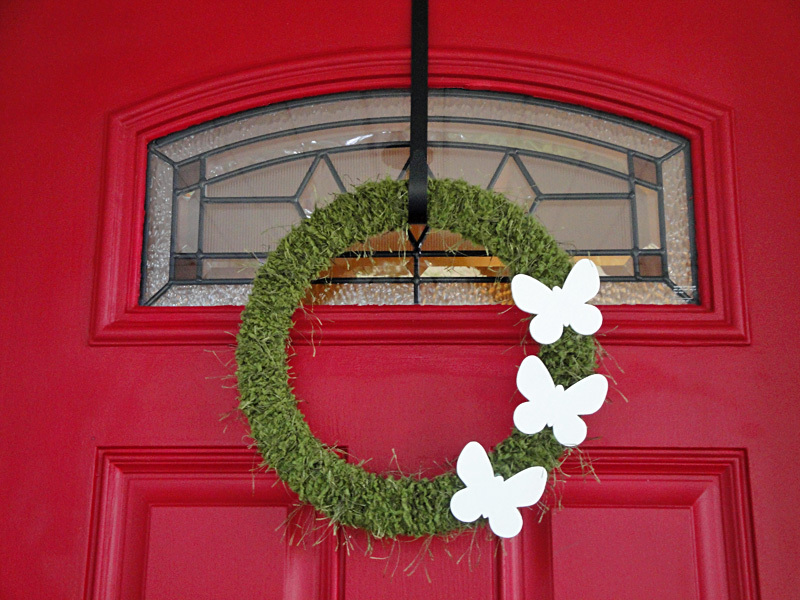 I used a wreath in last month’s centerpiece design and this month I adapted it to be my front door wreath. 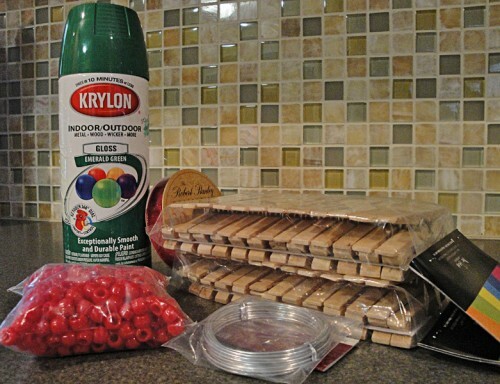 To do this project you’ll need the supplies I used last month (wreath base, yarn), some spray primer, and some 50 cent wood butterfly cutouts. I found those at Michaels in the woodworking aisles. I just spray painted the wood pieces with some primer, hot glued them to my yarn wreath and plopped it on my door. 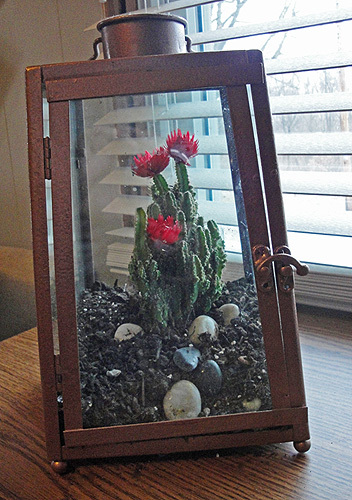 For less than $2 I’d repurposed a simple piece. If you ever outgrow a decoration, think of a way to make it work. 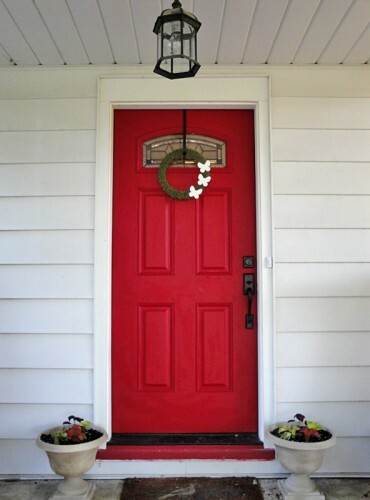 Sometimes it’s best to cut your losses but I’m loving the spring look on my front door right now. I’d just washed my door so pardon its streaky look. All the hail from the weekend knocked a bunch of dirt and mulch in every direction. We all survived and even our car survived being outside so I think streaks are the least of our worries. The only casualties were a giant branch (that I cut down myself) and our doormat who will be replaced as part of my big exciting summer porch prettying project. 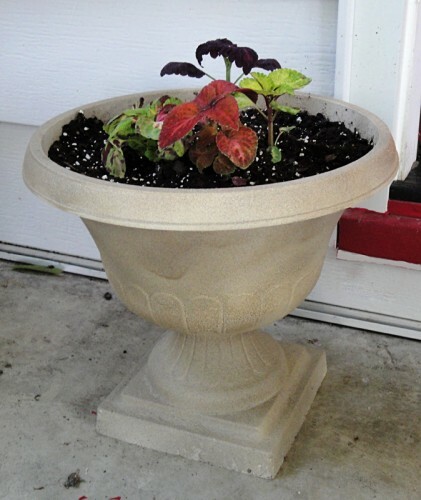 and finally filled with some coleus plants for some drama. If the weather cooperates I should have some nice progress photos of the front flower bed coming up soon. We finished up the rain barrel base tonight but it needs to cure at least two days before holding the 65 gallons of water in the barrel but all of the plants are in the ground and mulched so I hope to show you a good progress photo next week some time. 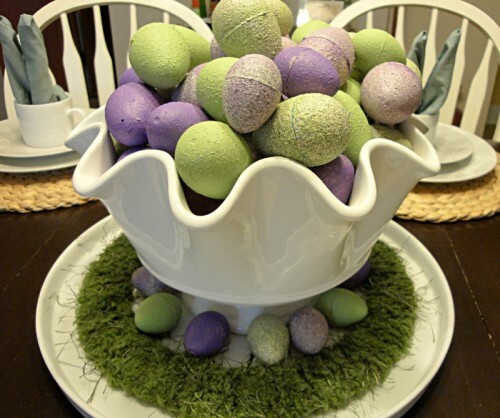 This month’s centerpiece theme is based around Easter. I’m loving purples and greens this year for Easter so I painted some dollar store Easter eggs with some Krylon Make It Stone spray paint. Then I topped them off with some acrylic paints and some watered down paints I misted on for a watercolor effect. Then I took a flat wreath base and covered it with a mossy green yarn following this technique so I looked like I had a nice grassy base to hide some eggs. 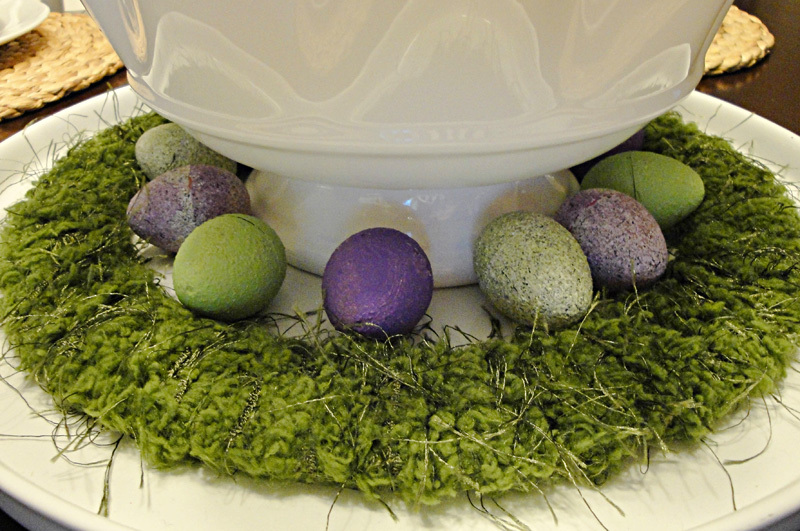 Then I plopped eggs all around and inside of my favorite scalloped bowl from Pier 1 for this super simple look. Tomorrow I’ll show you a perfect breakfast treat in the week and later on I’ll show you my favorite carrot cake recipe. If you want to try either of these dishes, the first requires yeast, an orange, and baking raisins in addition to the usual baking items. The second dish requires carrots, crushed pineapple, coconut, walnuts, cream cheese, and powdered sugar. What will be on your table for Easter weekend? I’m decorating my house for January right now. When I think January I think cold so I want to keep my house cozy, with warm candlelight and soft materials. Phase 1 of this plan was making some winter candleholders. 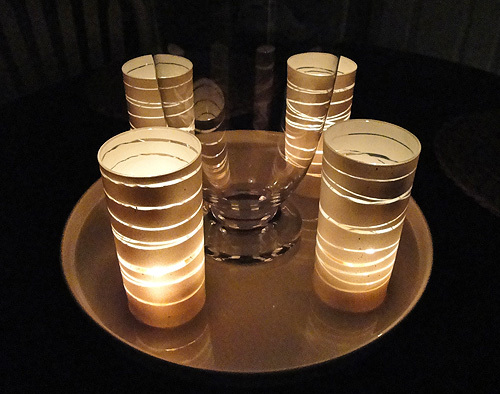 I wanted a snowy white color with warm candlelight peeping through. I’ve seen this idea before so I decided to replicate it on my own. Clean your cups so there are no fingerprint smudges. Wrap rubber bands of various sizes around your glasses. I liked angling some and adding thicker widths in the middle. Then take your glasses to your spray painting zone, turn them top side down and go to town. Mine required two coats for maximum coverage. Once you like your coverage, find a trash can and slowly begin removing the rubber bands. Make sure you’re wearing grubby clothes and in a messy space. Stretchy elastic + spray paint = tons of tiny little paint flakes flying everywhere. Learn from my mistakes. 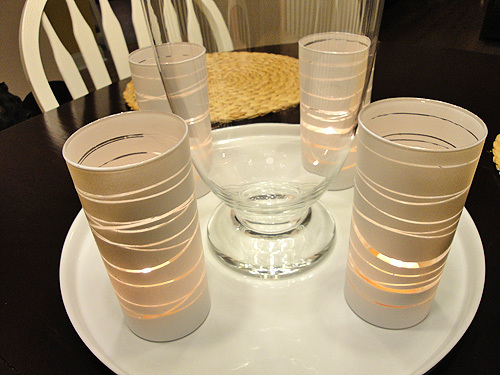 Once you finish removing all the rubber bands, wipe down your glasses with a wet rag and set some candles inside. Now dim the lights and enjoy your simple yet beautiful creations. I’m feeling warmer already. Tomorrow I’ll be back to show you what I decided to put inside that apothecary jar on my table. If you’re serious about getting organized in 2012, you’ll probably be tackling paper clutter sooner or later. What usually works for me is to have a big place where all the top priority papers go and to file them away as soon as I’ve tackled them. I made this frame a few months back for my sister-in-law’s bridal shower. The thing I love about it is how adaptable it is. We used it during the shower to hold cute little marital advice cards and now she uses it in her home to keep herself organized. 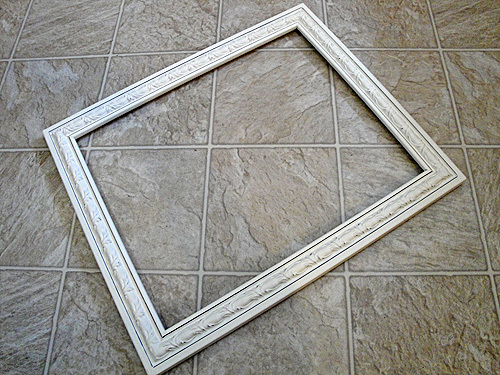 I started with a frame I got half off at Hobby Lobby, some Krylon Catalina Mist spray paint, some chicken wire (or poultry netting as my local home improvement store called it), and a staple gun. Start by spray painting the back of your frame, then the front. I did two coats on each side for some very vibrant color. 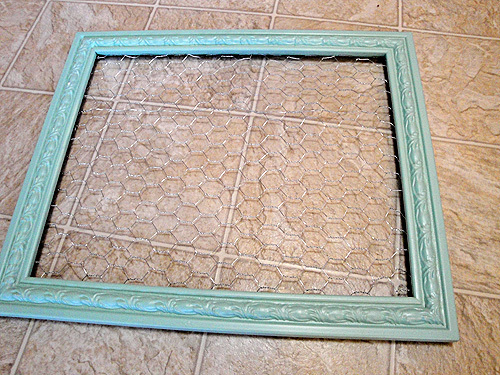 After this I cut the chicken wire to fit the back of my frame and used the staple gun to secure the wire to the frame. For the final display I made some printable cards, spray painted some mini clothespins to match, and lightly distressed the border. Here’s the frame displayed at the bridal shower. How cool is the photo display my other sister-in-law made? Red and aqua were the wedding’s colors so we both had fun making displays with the bright springtime colors. See how I made the red flower lolly for this frame. 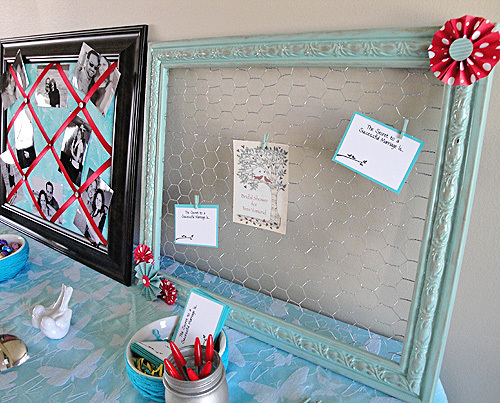 You could use smaller chicken wire and frames to display jewelry or accessories or make a version of your own to match your own house. 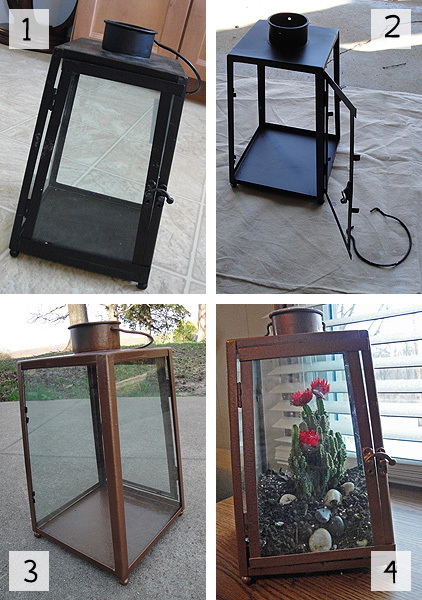 This is a really easy project that you can do in a weekend with some amazing results. I’d love to see how you organize and hear some of your best paper managing ideas in the comments. I’m a sucker for Pottery Barn. Unfortunately, I don’t usually have the budget to afford most of their items. 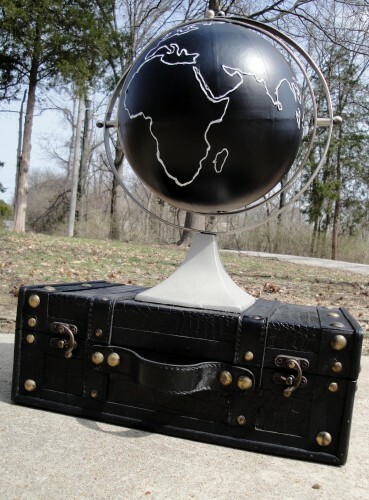 One item I fell in love with was their chalkboard globe that cost an arm and a leg (or close to $300!) so I decided to make my own. 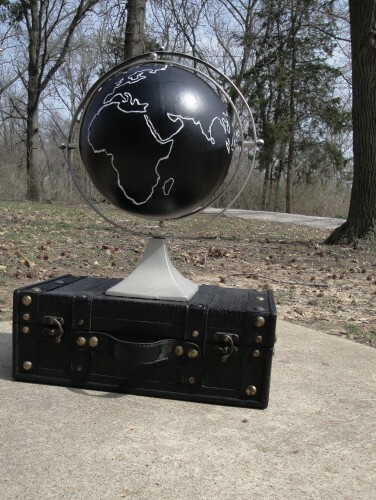 To accomplish my own chalkboard globe I went to another store I love, Home Goods. They had a bright orange globe that had a removable stand so I knew I was in business for under $10. I went to Hobby Lobby and picked up some black puff paint, Krylon Satin Nickel spray paint and some chalkboard spray paint. 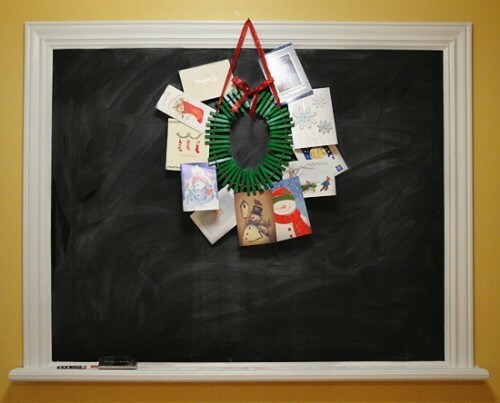 I had some chalk pens from another chalkboard project so I came in under my $25 total budget. 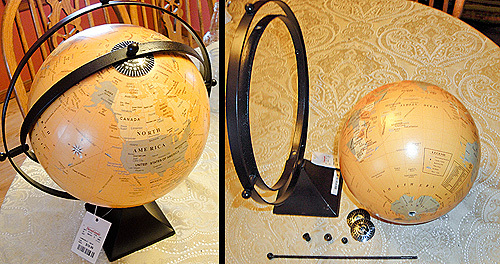 The first step you’ll want to do is disassemble your globe for easier spray painting. 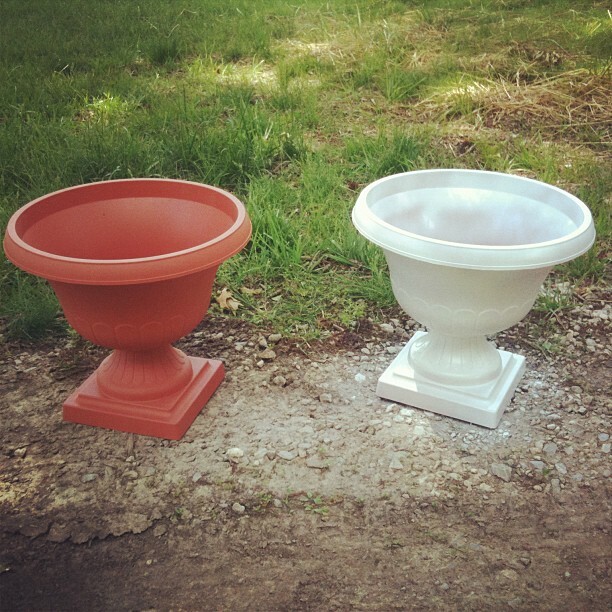 I spray painted my metal base and accessories with the satin nickel spray paint and let it dry. 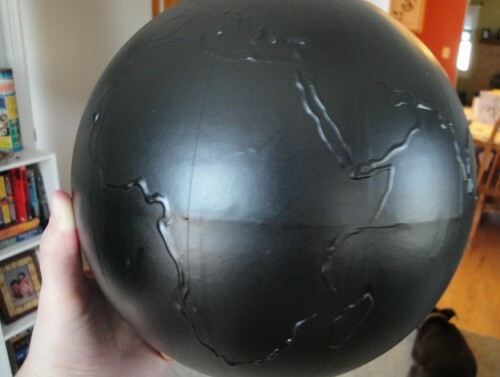 While I was letting my base dry, I used a dowel to hold my globe upright while I outlines all the countries and islands in black puff paint. This was so I could have a guide for where to draw my chalk countries on later since I’m terrible at freehanding it. My tip here would be to keep the puff paint as smooth to the globe as you can, you only want guidelines, not a 90s T-shirt. 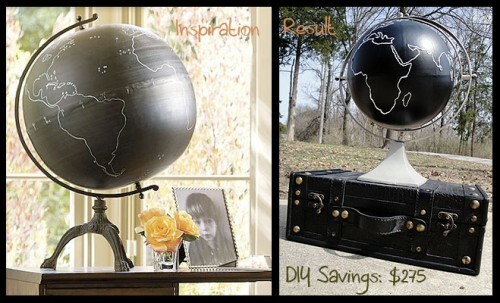 After the paint dries it’s time to spray paint your globe into chalkboard heaven. 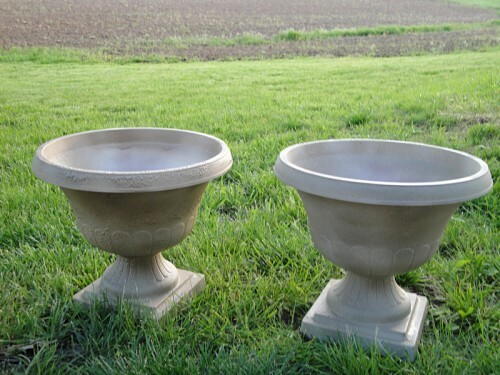 I ended up covering my globe about 3 times for a really solid coverage and durability.Keep in mind these are super thin coats since the globe is cardboard and you don’t want to make it too wet or it may warp. This was my globe before I outlined it all in chalk. It’s a beautiful shade of black/gray and pretty on its own. But let’s not forget the look we’re going for. It’s time to reassemble all the pieces! I’ve propped it onto a mini suitcase I bought from Michaels. Since I’ve finished the globe I’ve had fun mixing up how it’s decorated. Sometimes I shade in the countries, sometimes it’s just a basic outline. 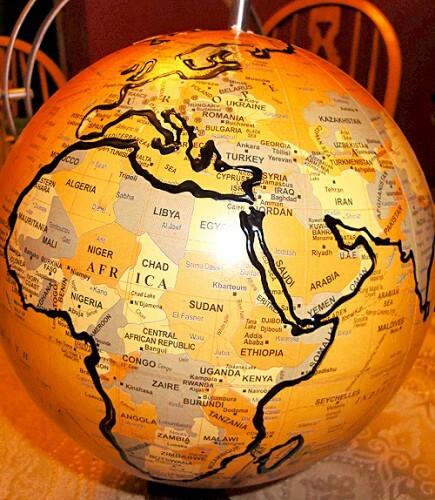 The globe is fully erasable once you let the paint cure so have some fun with it! You’ll be saving close to $275 depending on how much you find a globe for so you can’t go wrong with that kind of savings. Do you pin? If you’re not sure what that means, I’m talking about Pinterest, the website that is saving hard drives from the gigabites of inspiration photos people once saved. If you do know what Pinterest is or are hoping to find me on there, this is my Pinterest page. Either way, it’s amazing and has helped me be creative to the awesometh power so you should check it out. 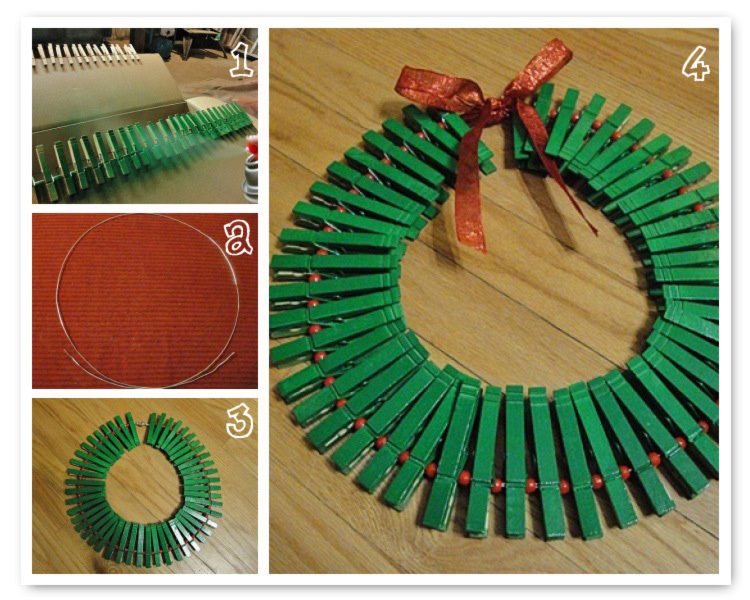 I had 3 yards of 16 gauge wire, 48 clothespins, a pack of red beads, red ribbon, and emerald green Krylon spray paint. 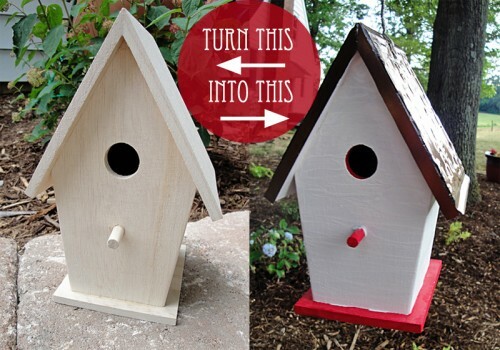 You’ll also need some wire cutters and scissors for this project. 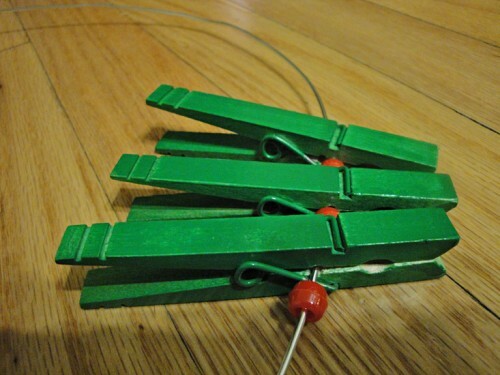 Step 1: Spray paint all your clothespins. I did 2 coats while they were all pinned on an old Ikea box. Step 2: Split your wire in half. Make each half into a circle. 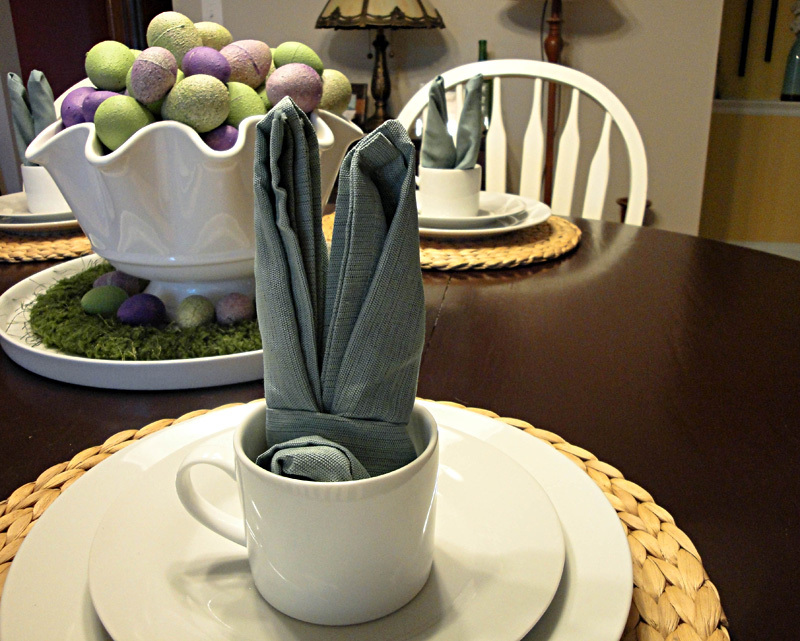 You’ll see I only did 1 here in the photo but in the end I had to use 2 since the clothespins really weighed it down. The original tutorial called for a wire hanger but I had followed Mommie Dearest’s advice of “no more wire hangers” so I had to make due with what was on the shelves of Hobby Lobby, hence the doubling up. When you get to the end, tightly wrap them together. My double wire made for a really supportive closure. Step 4: Attach a pretty bow over your bound ends. I also attached a ribbon to hang the display. Not too shabby. Certainly it’s a lot easier than having all the cards sitting on a table and having them fly off every time the heat kicks on. Pinterest saves me once again!